Taking the principles of Lean manufacturing to the next level takes effort. But more than that, it takes an unwavering focus on throughput to identify and eliminate waste in your manufacturing environment. Whether you are evolving to Lean methods or driving a Lean revolution – we can help you get started today. 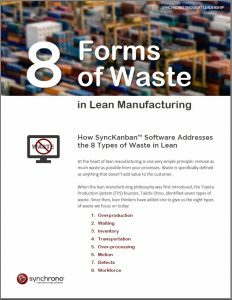 Let’s look at Lean manufacturing’s eight forms of waste – and how Synchrono® helps you solve these issues with synchronized systems designed to elevate your Lean initiatives and support your continuous improvement efforts. 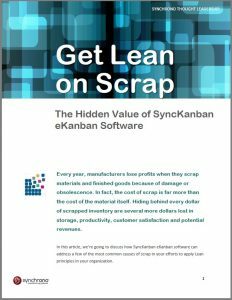 All Synchrono® software offerings help you become Leaner—and here are some practical reasons why. 1. Overproduction – Are you manufacturing more than consumers demand? SyncManufacturing® demand-driven planning, scheduling and execution software from Synchrono®, drives production based on actual customer demand and releases work into the system using its patented CONLOAD™ technology that drives flow through constraints management. When an order is received, SyncManufacturing® synchronizes materials, machines, people and data to deliver on time. 2. Waiting – How much lag time is there between production steps? CONLOAD™ technology ensures that work released to the shop floor is in full alignment with constraints, clearing any congestion and driving flow. By gating work into the system based on the capacity of your constraint, you’re working at maximum velocity, reducing any lag time in the path to fulfilling your order. SyncOperations™ workflow automation, data historian and data collection software powered by Savigent, gives you the ability to monitor and synchronize data from all equipment and processes in real time. The result is more fluid workflow automation with access to actionable manufacturing data and the ability to instantly track and improve performance, availability and quality. 3. Inventory (work in progress) – Are your supply levels and work in progress inventories too high? SyncKanban® is an e Kanban inventory replenishment system for supply chain execution and collaboration that sends real-time demand signals across the organization. Inventory is always right-sized because the system actively monitors variations in demand and automatically resizes and adjusts inventory levels as part of a continuous improvement effort to eliminate production waste. 4. Transportation – Do you move materials efficiently? Synchronizing your supply chain – and your data – with Synchrono® allows you to drive continuous improvement programs that identify and eliminate transportation waste. Real-time visibility into the status of moving parts and processes protects flow—even as it moves outside the factory doors. 5. Over-processing – Do you take unnecessary steps in production, or otherwise work inefficiently? Synchrono® offers solutions to address over-processing issues related to a variety of factors, including streamlining production steps, guarding quality, machine malfunctions, communication problems and more. Scheduling production using SyncManufacturing® software streamlines production steps, ensuring you have all the necessary materials and resources on hand to complete the order and then effectively manages constraints to drive flow. SyncOperations software monitors machines and automates workflow to ensure equipment and processes are operating at optimal levels. And should a machine malfunction, SyncOperations signals SyncAlert® software to quickly drive a resolution. Finally, any over-processing issues caused by poor communication can be addressed by providing enterprise-wide visibility to KPIs, status, alerts and more through SyncView® software. The entire suite of Synchrono® products delivers on the over-processing issue from different angles in the supply chain. For the first time, many of our clients get a true picture of this and other forms of waste. 6. Motion – Do people and equipment move between tasks efficiently? SyncView® is a real-time, synchronized visual factory information system that gives everyone the ability to monitor equipment and process status as it happens – from wherever they are. SyncView® software visualizes data the way you want to see it, giving you instant access to information that will drive quality decisions throughout your organization while empowering continuous improvement initiatives and tracking the motion of people and equipment throughout the system. You protect throughput and identify constraints faster. SyncManufacturing® planning, scheduling and execution software has also allowed manufacturers to free up capacity so they are able to effectively cross-train employees around the plant. One Synchrono® client has employees monitor real-time status indicators in SyncManufacturing® and, if their area is ahead of schedule, empowers them to move and lend a hand to other work cells with priority projects. 7. Defects – How much time do you spend finding and fixing production mistakes? Synchrono® systems help identify and resolve production issues, effectively managing constraints, minimizing downtime and waste. SyncOperations™ workflow automation, data historian and data collection software powered by Savigent, monitors and synchronizes data from all equipment and processes – signaling quality or maintenance issues in real-time. These events are captured in SyncAlert®, alert notification and escalation software, which sends instant messages to those responsible for resolving the issue, tracking outcomes and escalating notifications as necessary to ensure a timely and effective response. All production activity can be monitored using SyncView®, a visual factory information system that allows anyone to create graphical displays using drag-and-drop tools to view KPIs, machine status, alert tickets and more. And through SyncView®, users can drill-down into deeper layers of information for root-cause analysis or data to lend focus to continuous improvement efforts. 8. Workforce – Do you use workers efficiently? As the name implies, Synchrono® is all about synchronization – aligning your workforce, methods, machines, materials and information to provide a single version of the truth, visible to all. Everyone sees the same production status information and everyone knows their priorities. In our view, synchronization and flow are the key components that will drive the most value for you and your customers. Synchrono® facilitates flow through both synchronization and our patented CONLOAD™ technology that clears congestion by effectively managing your constraints. Synchrono® demand-driven manufacturing software incorporates the best of Lean Manufacturing, Theory of Constraints (TOC) and Six Sigma methodologies to provide transformative cost-saving and competitive value to you and your customers. Get Synchrono® and get in sync with your demand. Schedule a software demo and see for yourself. Learn about Demand-Driven Manufacturing from multiple perspectives. Tune into the Demand-Driven Matters blog.